Moving on with early PC scams, Jason Scott enumerates a few cases where con artists would attempt to sell imaginary or non-functional equipment back in the day. Like I said, it was an expensive time, and there were a lot of promises. 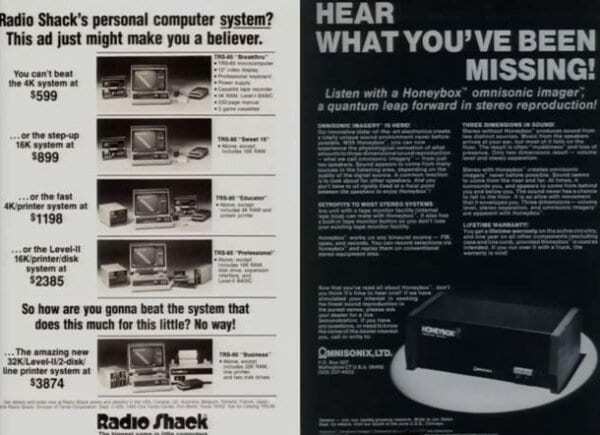 This (see right-hand image) is Radio Shack, who has turned out to be a relatively legitimate company. On the right is Omnisonix, Ltd, who is offering you a “Honeybox omnisonic imager, a quantum leap forward in stereo reproduction.” There is so much goodness in the copy here, copy that you would take to your own products and apps. And I promise you instant, instant interest. Retro fits to most stereo systems. Now, remember that this was at the time when the RCA plug was the primary interface to an audio box. “You can now experience the psychological and physiological sensation of what amounts to three-dimensional sound reproduction, what we call Omnisonic Imagery from just two speakers. Sound appears to come out of many sources in the listening area, depending on the quality of the signal source.” It is promising you that this box will change everything. Now, I’ve had somebody who worked here tell me that it was actually pretty awesome, but it was mostly an echo chamber. So, in this minefield of what’s real and what isn’t you have something like this (see right-hand image). This is “Hello fellow computerist…” from Perry and Coreen Pollock, who were talking about World Power Systems. 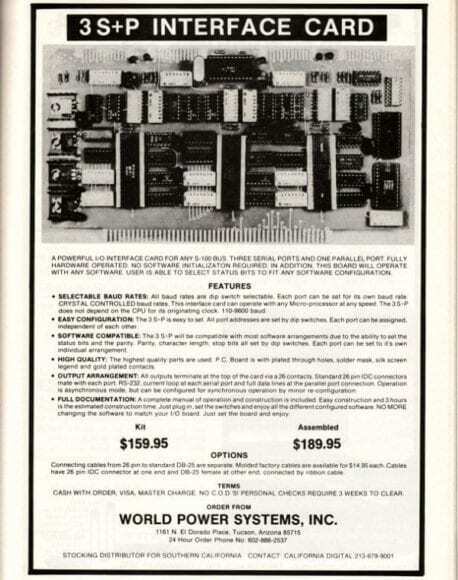 World Power Systems, as you can see on the right, offered you wonderful things: three powerful interfaces for the TRS-80 and S-100 bus, consoles, programmers, modules that you could buy; serial parallel I/O modules. As if through glass, let me tell you about the predator, because everything you’re looking at here is an absolute lie. There is no World Power Systems, there is no such thing being sold. If you give them your money, you’re never going to see that money again. It gets even better: the two people in the picture are partners of the person and they are about to be screwed. They are painted as the CEO and the Head Treasurer, but, in fact, they have no power whatsoever. 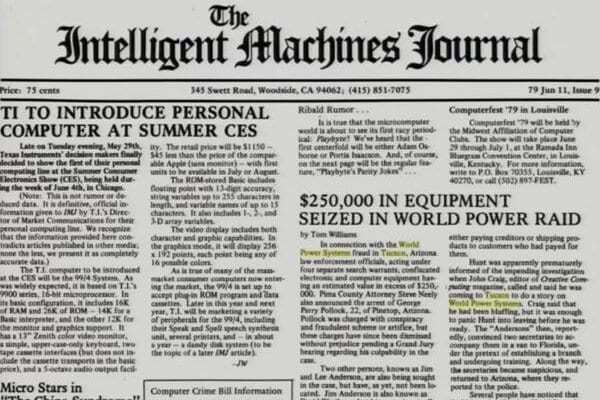 World Power Systems existed for one purpose: to advertise in as many magazines as quickly as possible things that did not exist, get you to send them money and then disappear, i.e. the bust-out. 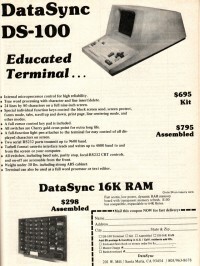 The guy who ran it, the Colonel, had run previously a company called DataSync, the DS-100 Educated Terminal. Colonel Winthrop, which is not his real name, had basically sold this item, this kit (see left-hand image), which also didn’t exist, and had gone to jail. But it was a minimum security prison, so he busted out and started World Power Systems. So dude goes on the run, leaving these two people to get arrested. They were later released. I found an article about it where she showed up. She had since gotten married again, got a kid and was like: “Wow, people still remember this story,” because for her this was well over 30 years ago, but it was still amazing, that World Power Systems. 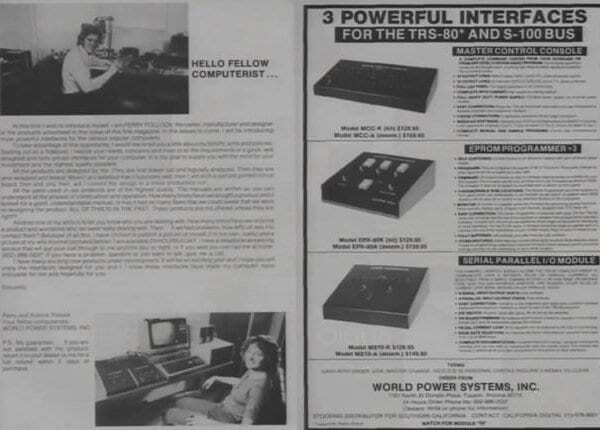 Now, here’s the thing: in a weird linkup, Tom Jennings, who created FidoNet, needed a group to do some of his electronics projects, and he named it World Power Systems, entirely on purpose, as a reference to these scam artists. And for a short period of time he lived in the same town as the original World Power Systems was running. And there were people 25 years later who thought he was the same guy. And he had to address people who were very angry. A quarter of a century later they were angry and bitter at how they got screwed over. The Colonel, Mr. Hunt – it was his real name, by the way – made one major mistake, and it was the 3S+P Interface Card (see right-hand image). I’ll give you 5 seconds to go: what is the terrible mistake that this con artist made which you should not make? Showing the actual chips wins the game, good job. Don’t show people something that doesn’t work, utilizing chips that don’t do what you put them next to, with no obvious power running to them. This terrible snake oil chip, which could not plug into anything, and which was running all manner of things, immediately got the attention of people going: “I don’t understand what this is,” writing to the paper and things falling apart extremely quickly, causing him to go on the run and the other people to be arrested. They had brought in, like, $250,000. This (see left-hand image) is an article from 1979 about it; I’ve put it there. It took the World Power Systems group. It turned out that they had gotten a lot of people to give them money. 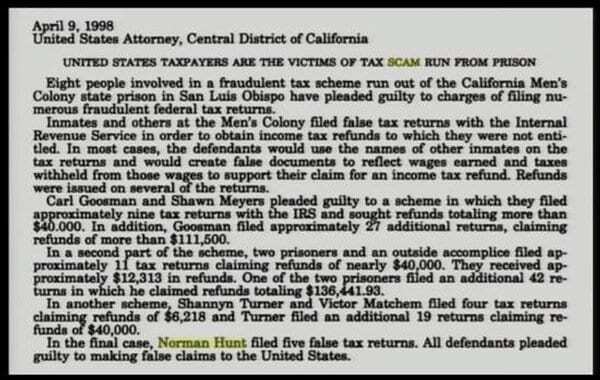 His name was Norman Henry Hunt; he was convicted of fraud. He escaped from Chino, which, apparently, was very easy if it’s minimum security. He was later arrested for this and went to jail. So, the Colonel was in jail, and it turned out in the 1990s there had been this scandal. It turned out that there was a tax fraud scheme where people were filing tax refunds for people who didn’t exist, and getting thousands and thousands of dollars in tax refunds. And when they figured out who was doing it, it was a bunch of prisoners, of which he was one of them. They then had to try and convict him for tax fraud in prison, where he was. 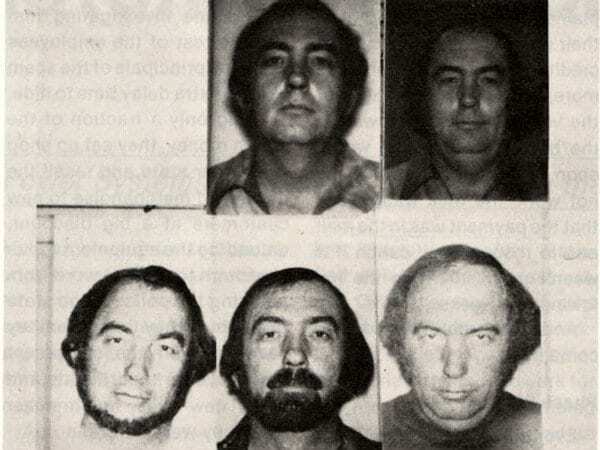 So, in 1993, in prison, for things he’d done in the 1970s he was committing more fraud to give himself more money. Where does that come from? Where do we find that? That, to me, is the fascinating thing in all of this. Where do these people come from? Of course, the other magazines were more than happy and quick to point out: “Oh, we wish that it never happened.” And they produced this article in InfoWorld about how to tell if you’re being scammed (see left-hand image). 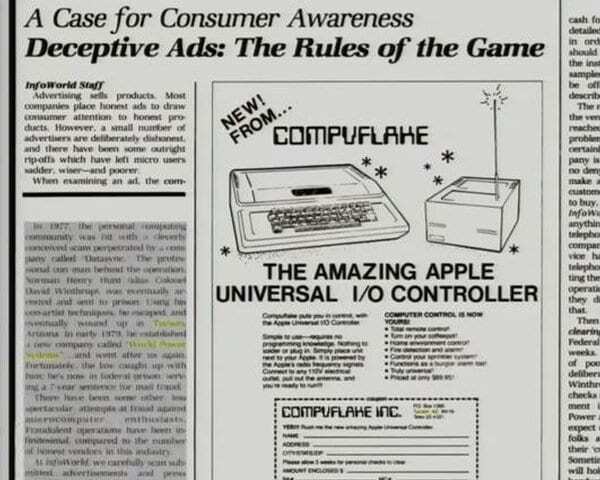 So they create a fake ad to warn you, which is kind of a things-you-should-be-aware-of deal in a police handbook. You know: “Oh my god, look out, it’s wireless; who could trust something that’s wireless? 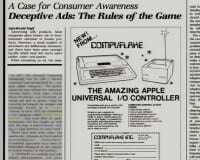 Look at this interactive square black box; who wants to trust a square black box promising you things?” And this is every goddamn ad in every goddamn computer magazine, from then till now, and until the end of time. This (see right-hand image) was the article about him with the tax fraud. And they had actually gotten him $40,000, with total going to $136,000. So it was going pretty well. Actually, Datasync really did have a product, as well as a talented crew of developers who were cheated out of pay by Col Winthrop/Hunt. I know because they were my friends, and I was briefly their tech writer. (I bowed out early because Winthrop kept hitting on me, and I thought he was a creep.) The development team went on to Silicon Valley and to places like NASA, and we’ve all done pretty well in tech in times since. 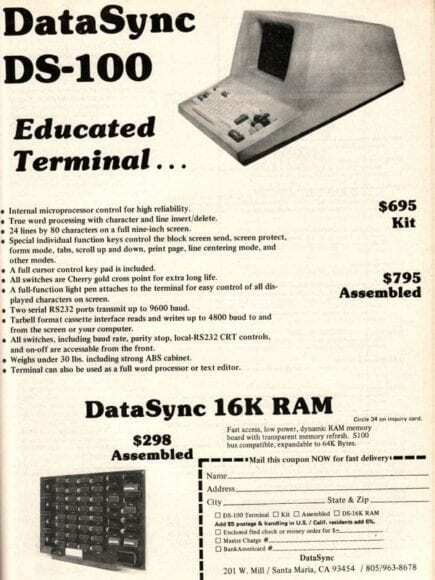 DataSync was a startup, pure and simple. There were some promising prototypes being developed when it went south, but all “Winthrop” could think of was syphoning out the money. Law enforcement confiscated everything even remotely involved with the startup company as evidence, after Hunt tried to skip, and we had trouble even getting back people’s personal property. Too bad, because there were some amazingly bright people involved. He had a rap sheet as long as your arm when he founded DataStink, and it was interesting to hear how he’s just kept adding to it. I was working at Byte Shop #8 (Hayward, California) in the late 70’s / early 80’s. 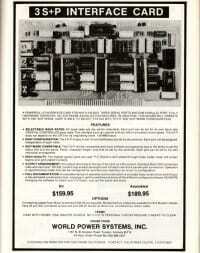 We actually got paid by World Power Systems for some computer equipment they ordered. And then got lots of calls from other suppliers when WPS listed us as a credit reference. We said, “They placed one order and paid for it.” which apparently was enough and all part of Hunt’s plan. I remember the magazine ads looked goofy – poorly cut&paste photos, traces that went no where, etc. I didn’t notice that final ad with no power to the board, but we all referred back to it once we heard. The specs and prices all seemed amazingly low. Arguably, the memory of WPS made it harder for other, actually honest start-ups, like Osborne who offered more in their package at a lower price, to be believed.